The railway station at Blandford was located in the county of Dorset, on the southern part of the main line of the Somerset & Dorset Joint Railway (S&DJR) from Bath to Wimborne. The southern end of the S&DJR was constructed originally by the Dorset Central Railway (DCR), which was opened on 1-November-1860 as a single-track line from Wimborne to a temporary station at Blandford St Mary. 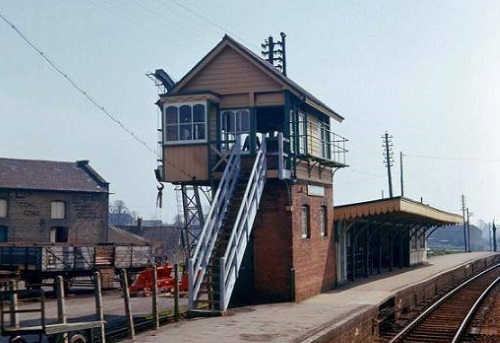 In 1863 the DCR was extended northwards to join with the Somerset Central Railway (SCR) and a new permanent station was constructed in the town of Blandford itself. The DCR and SCR had merged in 1862 to form the Somerset and Dorset Railway, which became the S&DJR in 1875 when the line was leased jointly by the Midland Railway (MR) and London & South Western Railway (L&SWR). After the Grouping of the railways of Great Britain in 1923 the S&DJR remained a Joint line, but now under the control of the London, Midland & Scottish Railway (LMS) and the Southern Railway (SR), who were the successors to the MR and L&SWR respectively. When the railways were nationalised in 1948 the Joint line came under the control of British Railways (Southern Region) (BR(SR)), who retained control at Blandford until the S&DJR closed on 6-March-1966.